Delivered these German Chocolate and Vanilla birthday cupcakes the other day for someone in town visiting for the Olympics; they were ordered by his super-nice executive assistant. Yum! This entry was posted on Thursday, February 18th, 2010 at 12:56 am	and is filed under Baking. You can follow any responses to this entry through the RSS 2.0 feed. You can leave a response, or trackback from your own site. ninebunnies provides yummy baked goods for the Greater Vancouver Area. You can find us at most local markets. Have an office in downtown Vancouver? 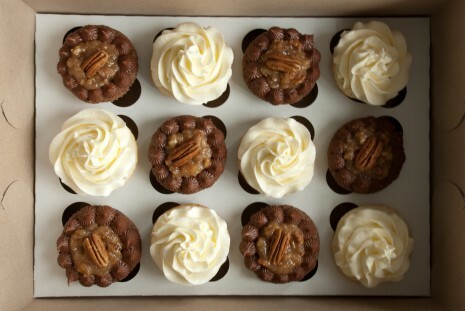 Let us cater your next meeting with baked goods everyone will enjoy.